All guild members are welcome at Comfort Quilts, a group that creates quilts for hospitals, shelters, fund raisers and individuals in need of comfort. Starting on Sept.20, Comfort Quilts will be following their Winter Schedule at the North Salem Ambulance Corp, 14 Daniel Road. The CQ schedule until the end of the year is as follows: Sep. 20 (no CQ Sep. 6), Oct. 4,18, Nov. 1,15, Dec. 6,20 – Dates are subject to change, so please verify. 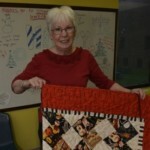 For twenty years, Barbara Powers has been the coordinator for quilts that are distributed to the Behavioral Health Center. This September’s distribution will include the 1,000th quilt delivered to this small hospital which sits on the grounds of Westchester County Medical Center. Here children between the ages of 4 to 18 with mental illness are treated. Our quilts are well received and are among the few possessions owned by these children. Congratulations to Barbara and to the talent and generosity of the Comfort Quilters and Guild members who make this contribution a reality. Mary Cannizzaro, the coordinator of the 2019 raffle quilt, will be handing out quilt block packets for Jack’s Chain at the September guild meeting. We will have a sample table runner illustrating the design. Any member who would like to work on this project is welcome to pick up a block and return the completed block at the October meeting.